Webcasting is a communications tool that utilises the power of the internet to make media broadcasts available to users. Businesses can benefit greatly from webcasting especially sales teams who can reach a greater audience with presentations using webcasting technology. Webcasting, sometimes known as streaming, can be used to broadcast audio, video and other content such as graphics and slides used for presentations. The technology behind webcasting services compresses the media files and then converts it into a format that can be viewed live without the need for any downloading. The media files can then be viewed online from the user’s computer either as a live broadcast or saved and viewed later. Cost cutting, as no hotel or travel fees for employees to attend sales conferences. The broadcasts can be viewed anywhere in the world, which is useful for home workers and off site staff. Can build brand awareness for products by reaching a wider consumer base. Webcasts can be stored and viewed later by anyone who has missed a broadcast. A complete library of webcasts can be stored and then viewed by employees and clients. For some businesses information is their main product. Webcasting services can now be used instead of the traditional methods such as CDs, DVDs and handbooks. An example of this can be educational supply businesses such as universities or foreign language teaching. Webcasts can be used instead of spending a great deal of money on actual teaching supplies. Clients can simple view the educational information as videos using the webcasting services. This method is convenient, cost cutting for the business and easier to use for clients and customers. 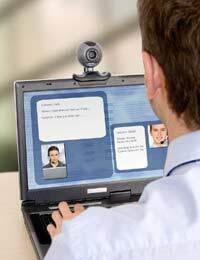 Webcasting software is relatively easy to implement and use. The actual viewing webcasting software can be free to download. There are webcasting consultants who can implement the technology if the business is intending to broadcast its own webcasts. There are a number of different webcasting software and hardware companies, and although the technology can be expensive there are companies that will rent to businesses. These companies will also provide all the backup and support online and onsite when needed. Webcasting services have been used very successfully for staff training purposes. There are many different businesses that provide a whole range of broadcasts on a variety of business subjects. These can then be used by businesses to enable employees to keep up to date with the latest developments and skills within their particular business. Employees can gain a whole new range of skills and sales techniques from experts in their own field. It is a simple business method of passing on information to other businesses. Product advertising and marketing can be given a huge boost by using webcasting services. Not only can clients and customers view the product information as it is being broadcast but the webcasting technology allows for discussions and questions as the webcast is actually playing. This technology allows for a greater degree of interaction that is especially beneficial during and after sales conferences and presentations to a global audience. Webcasting services can be beneficial to most businesses, especially those that are continually learning new business skills and looking for ways to obtain expert information. Businesses that want to keep up to date with the latest sales and advertising techniques or those who wish to reach a larger audience can seriously benefit from this technology.